Finley, a five-month-old golden retriever, is being trained by USF student Meghan Watson for Southeastern Guide Dogs. Anja is a 9-month-old black lab. The new Puppy Raisers Club at USF Tampa recruited potential volunteers at a campus volunteer fair in September. Anja with trainer Brian Cullum, Finley and Watson, Marvin and Cianna Cilenti and Sadie with USF grad student Zac Giparas. Within the next few years, the quartet – Finley, Anja, Marvin and Sadie – could end up as guide dogs for the blind or service dogs for veterans suffering from post-traumatic stress disorder – and USF students are playing a part. Students on both the Tampa and St. Petersburg campuses are answering the call to help the Sarasota-based non-profit group Southeastern Guide Dogs by setting up clubs of eager volunteer trainers. 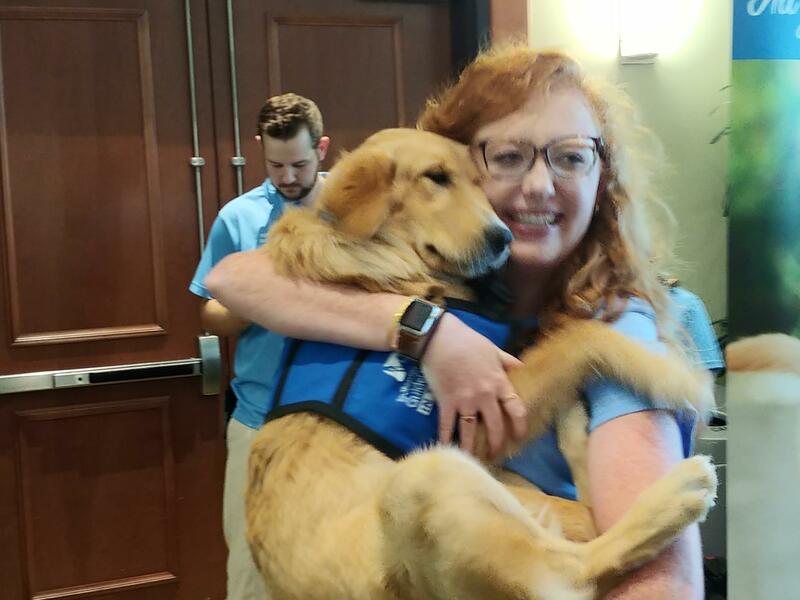 “The main job of a puppy raiser is to teach the puppy their basic obedience commands and to get them out in the community and socialized and comfortable with anything they might encounter on a daily basis so that once they do go to the permanent person that they’re going to be with, they are prepared for anything,” said Meghan Watson. The senior business marketing major helps run the Tampa club and is training her second dog, Finley. She jokes that the 5-month-old golden retriever is her “Velcro dog,” accompanying her everywhere she goes. USF Tampa senior Meghan Watson and the puppy she's training, Finley, a five-month old golden retriever. “Finley has really developed into a pup that wants to learn, she’s very curious, she wants to know what everything is,” said Watson. That curiosity helps, as Watson said Finley seems to be picking up the basic commands like sit, stay and heel pretty well. “And then there’s more advanced commands such as close, where they curl up between your legs and lay down,” she said. That command comes in handy when dogs accompany their trainers to class, where they’re expected to be seen and not heard. That dog, Rosie, has been in formal training at Southeastern to become a guide dog since May, and should be placed with a new owner later this year. Laura Zellner is Southeastern’s regional manager for puppy-raising services. She said college students like Watson make great trainers for a number of reasons. One, they have the energy to keep up with the pups. Two, they’re regularly on a busy environment with lots of people, the perfect place for a would-be guide dog to learn to focus. Zellner added that a crowded event like the volunteer fair is also perfect to see not just how the dogs might react – but how their trainers do as well. “If you walk into an environment such as what we were experiencing today and the dog is showing stress signs, you need to be able to leave and be prepared to leave and not just say, ‘Oh no, I’m going to be here cause I want to be here.’ It’s all about the dog,” said Zellner. 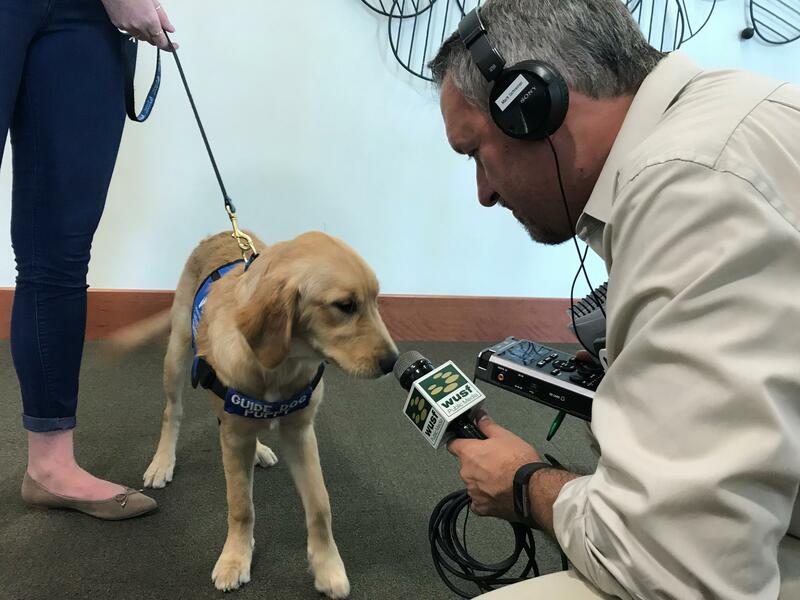 Reporter Mark Schreiner learned the hard way - Finley is a puppy of few words. While the Puppy Raisers Club is new at USF Tampa, it’s been in existence at USF St. Petersburg since 2016. They’re also taking the experience to another level, as more than 30 students are members of the Puppy Love Living Learning Community (LLC). The group of mostly freshmen live in their own section of a residence hall, and, come this December, be joined by four Southeastern puppies that they’ll help raise. Last school year, club president, senior Jesse Blackman, was among the students who raised the first dog who lived on campus full-time, a yellow Labrador named Petey. 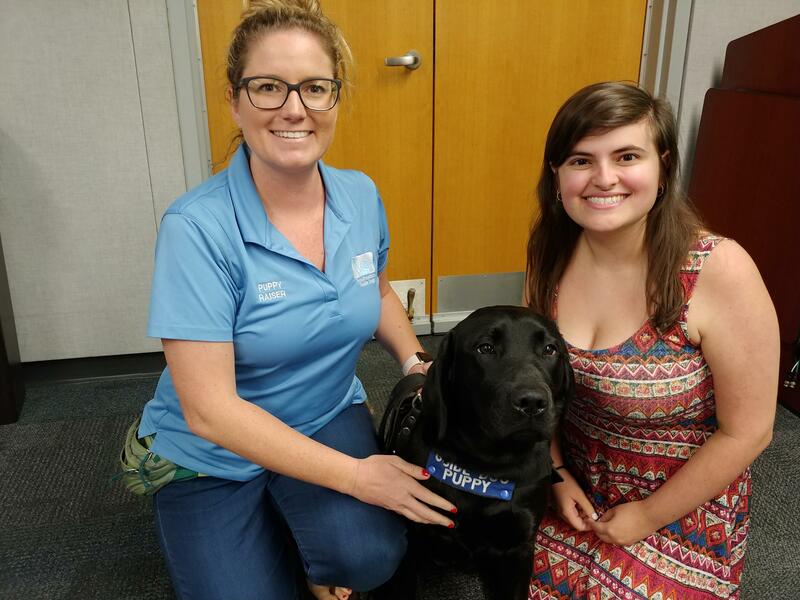 USFSP Puppy Raisers Club faculty advisor Steph Fuhr and club president, senior Jesse Blackman, pose with Celia, an 11-month-old black lab that Fuhr is training. “People were very accepting of Petey, I think that the biggest problem is that everyone wanted to say hello to him and after a certain time, they’re not allowed to be pet while they’re in their vest, so people were disappointed when they couldn’t pet him and say hello to him,” said Blackman. While Blackman and her three suitemates worked together to raise Petey, one person – in this case, student Stephanie Campos – was formally recognized as the puppy trainer. It’s a situation that will be repeated with the puppies when they move into LLC later this year. “So there’s one person who’s technically the raiser so it’s their responsibility, but it’s kind of like ‘it takes a village’ situation, so we all help out, we all watch the dog, we all take care of the dog,” said Blackman. Steph Fuhr is an adjunct instructor at USF St. Petersburg and faculty advisor to both the club and the LLC. She’s in the process of raising her second dog for Southeastern, Celia, an 11-month-old black lab who slept beneath the table at her feet during an interview. Fuhr said the students are “amazing” for taking on such a job. “Celia’s my second dog, and I was around 32 when I got my first dog,” she said, referring to Conway, Celia’s older half-brother who’s finishing training to become a guide dog. That last part – turning the dog back over to Southeastern is the one answer students trainers say over and over. But every time, it’s also marked with happiness about the difference the dogs will make in someone else’s life. “It’s the worst feeling ever, but once you see who they’re going to and what impact that they have, you realize that that person needs them so much more than you do,” said Watson. 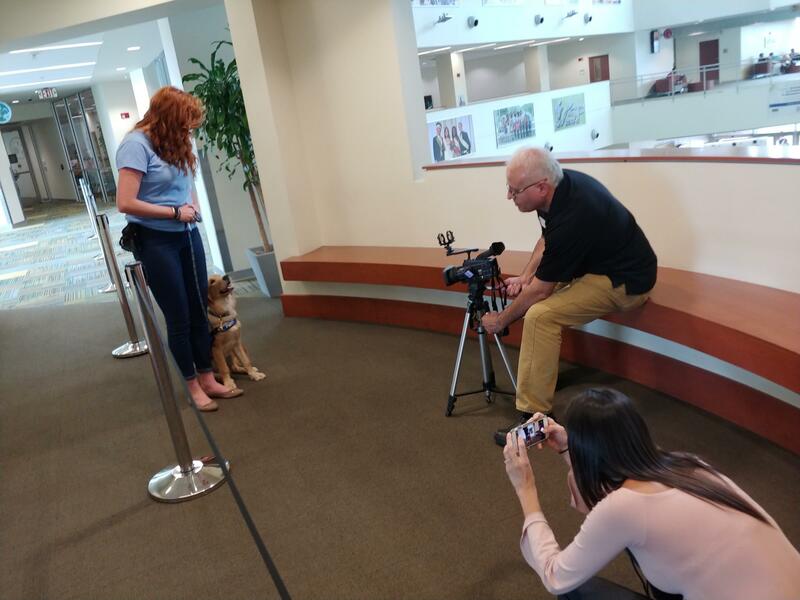 Finley is not sure she's ready for her close-up, as WUSF video producer Andy Lalino and radio intern Eillin Delapaz try to get a shot. There are four-legged residents of the Tampa Bay area who stand out in public because of their harnesses and vests. Some are working guide dogs, others are guide dogs in training. Southeastern Guide Dogs, a charitable organization in Palmetto, has spent decades preparing canines for the working world. This is a story of two dogs serving their country’s veterans through the Southeastern Guide Dogs Paws for Patriots program. There’s the “old girl” Brittani who has eased into retirement and the youngster Zak just graduated from “boot camp” still filled with puppy exuberance. Brittani is a Goldador, a mix of Labrador and Golden Retriever, and was the longtime companion of Michael Jernigan of St. Petersburg, a Marine wounded by a roadside bomb in Iraq in 2004.